If you’re curious what it’s like sailing where the water spins counterclockwise down the drain, I recommend a trip to the Whitsunday Islands in Queensland, Northeastern Australia. 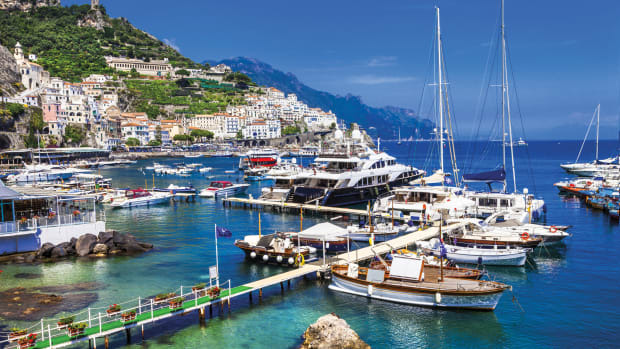 Not only do these wonderfully remote and tropical islands provide incredible cruising options, but the lush rainforests and gushing waterfalls of the nearby mainland are a joy to explore, either pre- or post-sail. The Whitsundays are a chain of 70-plus islands that got their name from Captain Cook, who sailed his legendary ship HMS Endeavour through this part of Australia on Whit Sunday (a Christian holiday 50 days after Easter, better known as Pentecost in the States). Truth be told, if you take into account the International Date Line (which did not exist in Cook’s time), it was technically Monday when Cook recorded the name in his ship’s log—nevertheless, it stuck. These islands are nothing short of spectacular—and with anchorages for all kinds of weather, it is very easy to sail here. My photographer and I planned a clockwise tour of the archipelago, with a main focus on exploring the largest island in the chain, aptly named Whitsunday Island.  Our trip started at Abell Point Marina in Airlie Beach with Queensland Yacht Charter, which operates in association with the larger international company Dream Yacht Charter. A couple of months beforehand, a major cyclone had hammered Airlie. 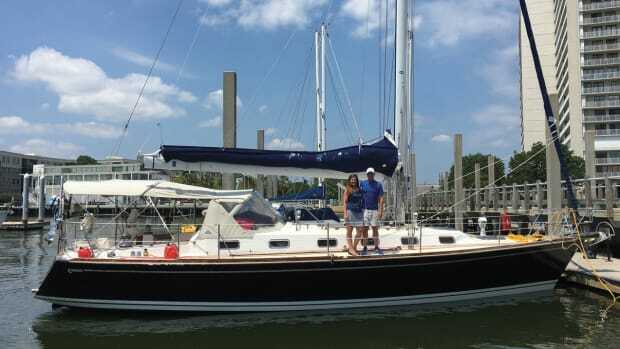 But in spite of what must have been a big mess, our Lagoon 400 was in great shape. 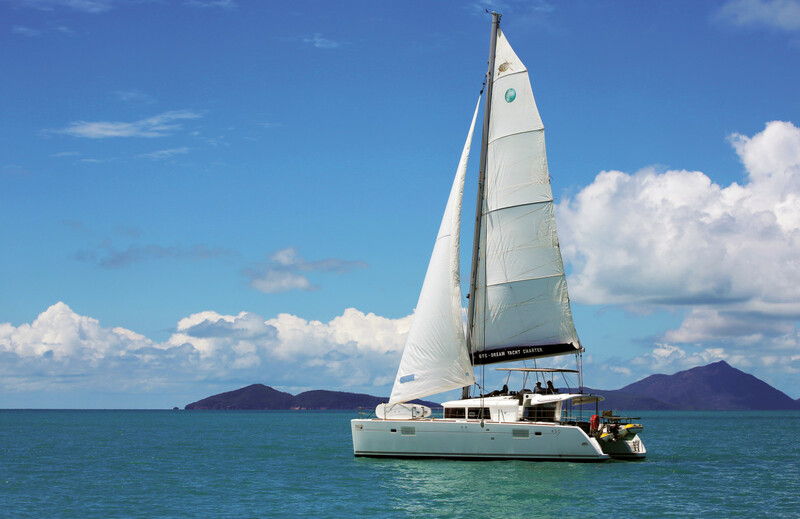 Another nice touch with Queensland Yacht Charter is that the base offers daily check-in calls with each boat to provide weather updates and other info. 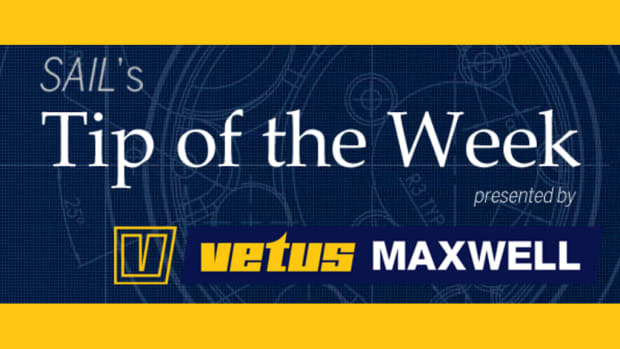 This not only keeps everyone safe and connected but provides a nice opportunity to get useful data, as there are always questions that pop up when you’re in unfamiliar waters on someone else’s boat. On days when we did not have time for these scheduled calls, we just shot them a quick message saying we’d check in the following day—no worries mate! A low-pressure system moved into the Whitsundays on our first day and brought with it torrential rains that reduced visibility to the point where I almost had to start ringing the ship’s bell. In spite of this less-than-perfect start, the rain finally stopped as we approached Nara Inlet on Hook Island, bringing welcome rays of sunshine for our afternoon sundowner. Nara Inlet is a deep, long, protected bay with a sandy bottom and lots of good anchorages. 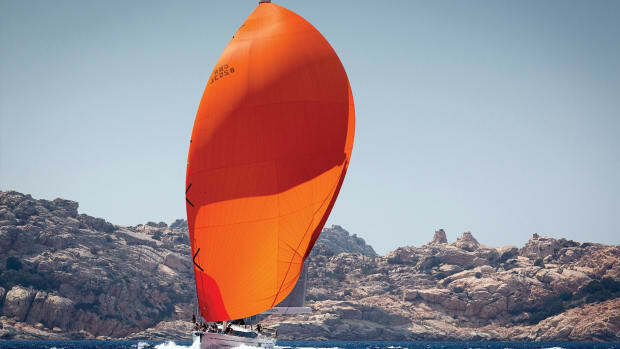 It’s an easy couple of hours sail from the charter base, making it a no-stress first day out. The following morning, we explored ancient cave paintings left behind by the Ngaro—a seafaring Australian indigenous people that lived in the Whitsunday Islands roughly 9,000 years ago. 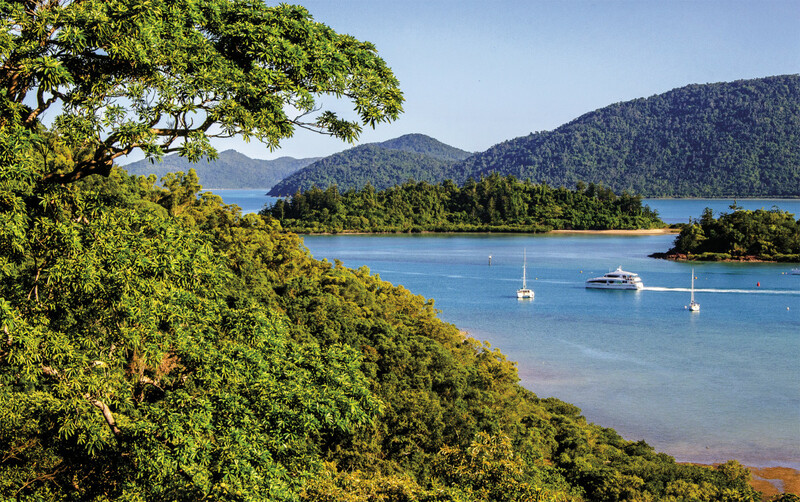 We’d read about the paintings in 100 Magic Miles of the Great Barrier Reef: The Whitsunday Islands, a local cruising guide written by David Colfelt that’s considered the “Bible” among sailors here. Nara Inlet also introduced us to the rather beautiful sulfur-crested cockatoos that are as prevalent as crows in this part of Australia. No need for an alarm clock when cockatoos are around, as these cheeky birds start the day off early with a hell of a racket. Our next anchorage, Stonehaven (also on Hook Island), was supposed to have excellent snorkeling. However, the recent cyclone had reportedly damaged some of the reefs, so we were not sure what to expect. Sure enough, after donning masks, snorkel and fins, I found a lot of wrecked coral. However, amongst the wreckage I also saw some healthy corals and sprigs of new life as nature began the process of repairing itself. Shortly after entering the water, I was joined by a roaming, friendly hawksbill sea turtle who also seemed to be enjoying the reef’s rejuvenation. Australia is famous for its poisonous and deadly creatures, and the animals you have to watch out for in the Whitsunday Islands are jellyfish. The two main poisonous species here are box jellyfish and irukandji jellyfish. A sting from either is not only very painful, but could necessitate a trip to the hospital or worse. Even more troubling, these jellyfish are both very small and largely transparent. 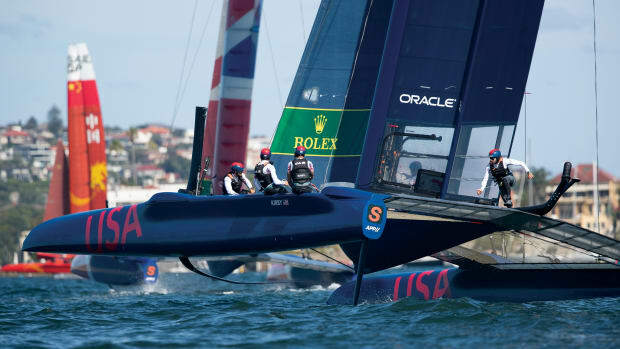 If swimming is a big part of your sailing routine, you should try to avoid jellyfish season, which is October to May. And whatever the month, you should always wear a lightweight stinger suit (essentially a very thin wetsuit). Given that the waters here can be a little on the chilly side, these stinger suits doing a nice job of keeping you warm and are therefore multi-purpose. We were able to rent ours for a very reasonable price from Aqua Dive in Abel Point Marina. The low-pressure system we encountered the first day brought a little more rain over the next couple of days, but we managed to find a few slivers of sunlight to enjoy some great snorkeling, exploring and beach time. Our next two anchorages—Blue Pearl Bay (at the top of Hook Island) and Cateran Bay (on the northern top of Border Island)—were just the kind of remote, wild and breathtaking experience we were looking for. Thanks to the storm (which had likely discouraged other sailors), we had no problem finding mooring balls and had these lovely spots mostly all to ourselves. Important to note, the Whitsunday Islands have only a few beaches with fine white sand (most notably Whitehaven Beach). The other more remote beaches are mostly crushed coral. So, bring your water shoes or flip flops for walking and something sturdier than a beach towel to sit on. You’ll also want to dinghy to the beach during a flood tide and head out soon after it starts to turn. These bays are a minefield of coral heads, and with the 12ft tides you find here, you might not make it out at low water. Also, if you land your dinghy at high tide and go for a long hike, you might have a long way to drag it back to the water’s edge once the waters have receded. The opposite goes for a rising tide: don’t let that fascinating novel sweep you away, or the incoming tide might do the same to your dinghy. As one might expect, this remarkable piece of undeveloped real estate is very popular for day-trippers, especially given its close proximity to Airlie Beach and Shute Harbor. In addition to the tour boats that make the daily trip here, float planes and helicopters land and also take off regularly. So, take your time and enjoy the quiet and solitude of the smaller more remote bays and beaches in this glorious chain of islands. In spite of the activity and popularity, Whitehaven Beach is well worth a couple of nights stay. With four miles of sand to explore, no matter how many tour groups you encounter, there’s always plenty of room to have your own private beach experience. Better still, if you want even more privacy, there’s an easy-to-find trail that takes you over the headland to the secluded, quiet, beautiful and rather empty Chance Bay, my personal favorite of all the beaches we visited. 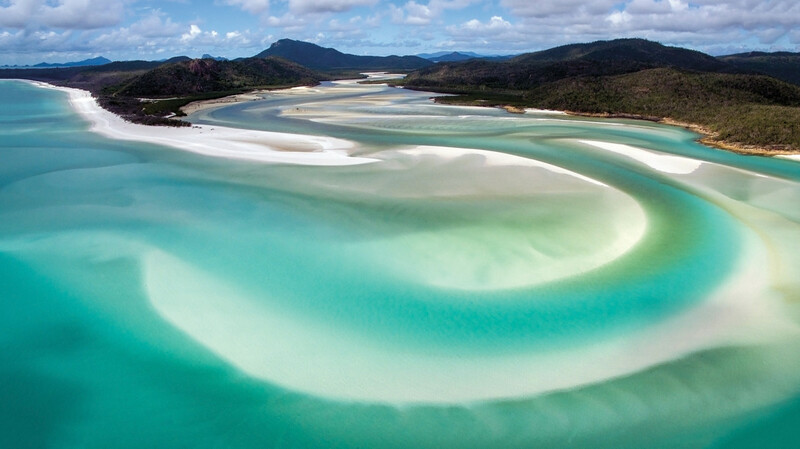 The best anchorage for Whitehaven Beach is in the southeastern end, if the weather permits. This will also put you very close to the trail to Chance Bay. 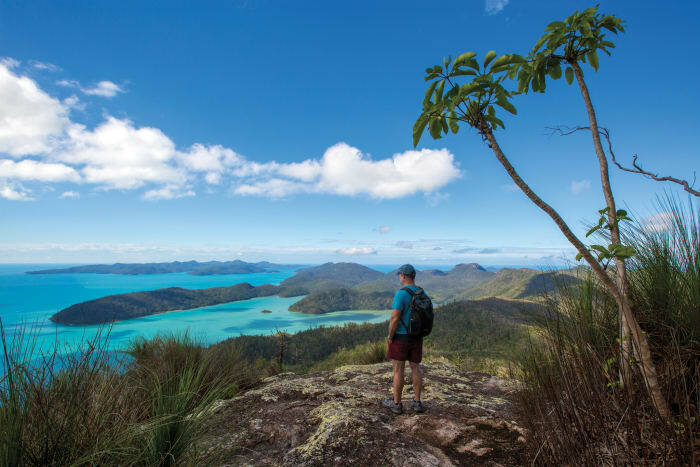 While on Whitsunday Island, you’ll want to explore Tongue Point—a peninsula on the northern end of the beach across from a tidal river called Hill Inlet. Low tide unveils an enormous white sand spit called Betty’s Beach, one of the main tourist attractions here. One way to access Betty’s Beach is to grab a mooring ball in Tongue Bay on the western side of Tongue Point and hike over. Another option is “day anchoring” in the mouth of Hill Inlet—just be mindful of the tides and currents. You can also take a long dinghy ride along the entire length of Whitehaven Beach from the anchorage at the southern end. We did this at dawn to get some early morning shots of Betty’s Beach and Hill Inlet, and while it burned a good amount of dingy fuel, it made for a wonderful early-morning wakeup run. There’s a well-marked trail from Betty’s Beach leading to a popular lookout that provides incredible views of the whole length of Whitehaven Beach. This is the best way to see and experience the many different shades of turquoise, cerulean and teal blues that are illuminated and accented by the brilliant white shifting sands at the mouth of the inlet. Be aware, though, that you’ll want to hit this place either early or late in the day as it can be swarming with people. For the truly adventurous, I highly recommend exploring Hill Inlet. 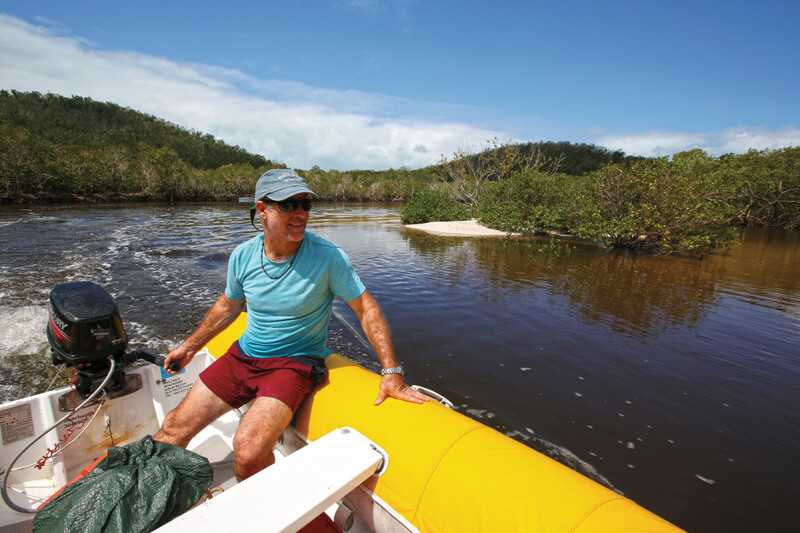 This is a dinghy-only adventure, as the waters in this tidal river are very shallow and the entrance can be treacherous, especially at low tide. Hazards aside, though, the excursion provided us a welcome break from the tourist crowds, as we didn’t see another soul—just a few crabs and lots of exotic birds—the entire time we were there. Ideally, you’ll want to start exploring the inlet during rising waters, and start heading back as the tide begins to ebb. Trust me, it’s really easy to get stranded here—you can literally watch the land emerge as the waters run out to sea. Leaving Whitehaven Beach, we braved the narrow Solway Channel between the southeastern tip of Whitsunday Island and Hazelwood and Teague Islands. The channel can produce some serious currents if you catch it when the tide is ripping, so be sure to hit it at slack tide. Our final anchorage was Sawmill Harbour on the western side of Whitsunday Island across from Cid Island. Sawmill Harbour got its name for a small lumber operation that at one time harvested loop pines here. Our focus was a fantastic and rigorous hike to a gorgeous lookout that provides a bird’s-eye view of the entire Whitsundays. It takes about two hours and is fairly steep, so it’s not for the faint at heart. Still, the view is well worth it, as is the trail, which winds through a lush rainforest rife with galloping lizards and lots of noisy colorful birds. If you’re not up for the hike, there’s a secluded beach here that served as a perfect spot for the last “sundowner” of our cruise. Again, while in Queensland, you should also factor in a few extra days before or after your cruise to do some land-based exploring. 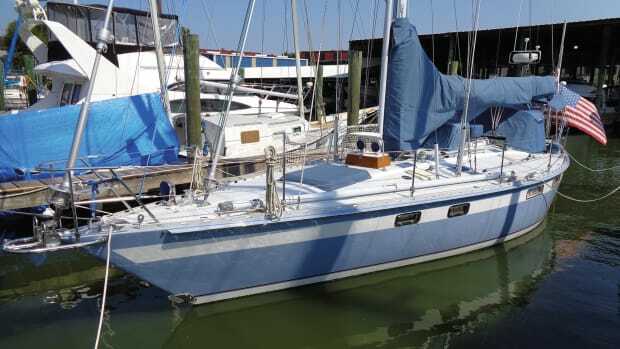 With this in mind, when our sail was over, we rented a car and drove north from Airlie Beach to Cape Tribulation, taking a few days to really stretched out the drive. Some of the amazing adventures we encountered along the way included: swimming in the crystal clear rivers and waterfalls in the Paluma Range National Park; river canyoning in Behana Gorge; interpretive trail walking along Spring Creek; snorkeling in Mossman River; cassowary “spotting” at Mission Beach; saltwater crocodile viewing along the Daintree River; skippered day-sailing to the Low Isles; and horseback riding on the beach at Cape Tribulation. For those who love snorkeling and diving, I also highly recommend a trip out to the Great Barrier Reef. If you have the time, the best way to see this enormous and beautiful wonder is on a liveaboard dive trip to the outer reefs. 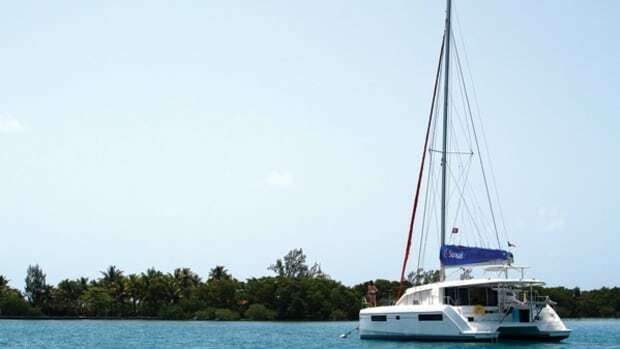 There you’ll find both privacy from day-tour groups and the healthiest coral and marine life. In our case, we joined the highly recommended dive operator Spirit of Freedom for a few nights out, and it was absolutely amazing. We swam with giant groupers, watched sharks hunt at night and in general were immersed in and awed by in the rich and varied abundance of marine life that defines this enormous wonderof nature. The Spirit of Freedom also has an incredible chef on board, which always gives you something to look forward to after your dives. The trip ended with a low-level flight back to Cairns, which took us over some of the wild remote rainforest and beaches on the northern coast of Queensland—amazing! If, on the other hand, you’re short on time and can’t manage a liveaboard dive trip, I would recommend taking a day trip out to the famed S.S. Yongala wreck. This passenger and freight ship went down in a cyclone in 1911, and has since become a thriving, artificial reef with unique inhabitants like guitar sharks and giant marble rays. Some divers claim it boasts 10 times as many fish as the Great Barrier Reef, which explains why it ranks as one of Australia’s 10 best dive sites. No matter how you experience Queensland, this beautiful and amazing part of the world will provide life-long cherished memories. There are few places in the world where you can find such great expanses of unspoiled wilderness and wildlife. Best of all, the culture and language here are both familiar and user-friendly, making it one of the easiest places to travel, even if they do drive on the wrong side of the road!